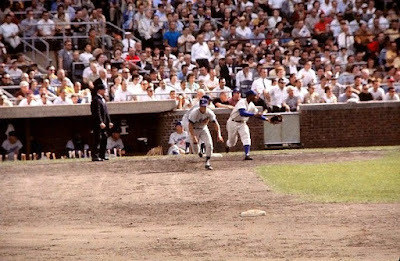 It looks like Maury Wills is about to steal a base with Ernie Banks holding him on. Featured above is a vintage, circa 1960's, Kodachrome 35mm Slide Transparency of in-game action between the Dodgers and Cubs. (Auction Link Here) Unfortunately, it is not dated but we do know it was taken at Wrigley Field, and by the looks of it Maury is about to steal one of the 29 bases he stole in Chicago throughout his career. The photo was taken by noted Chicago area freelance photographer Lee Balterman. This Day in Dodgers History: In 2001 the Dodgers traded a couple of minor leaguers for outfielder and future manager Dave Roberts. Happy Birthday, Buster Burrell, Tex Erwin, Al Ferrara, Steve Garvey & Ken Landreaux! Seán Devlin at Brownstoner shares a fantastic vintage photograph of; "The Brooklyn Dodgers (and Santa) Visit(ing) Children in a Crown Heights Hospital (1952)." Per Jim Carlisle at the Ventura County Star; "Vin Scully to receive lifetime achievement award" from Southern California Sports Broadcasters’. Why the New York Times is doing this? I dunno. Via Mike McPhate at the NYT; "California Today: Cast Your Vote for Californian of the Year," and Vin Scully is one of the choices. Via Jacob Unruh at News OK; "OKC Dodgers coaching staff to return in 2017." OKC and the Los Angeles Dodgers announced Wednesday afternoon the return of manager Bill Haselman, pitching coach Matt Herges, hitting coach Shawn Wooten and coach Luis Matos for a second consecutive season. Via the Tulsa Drillers at MiLB.com; "Drillers Announce 2017 Coaching Staff: Garko to Return as Manager with Full Staff from 2016." Per Bernie Plekoff at FanRag Sports; "Pleskoff Scouting Report: Alex Verdugo." Among Verdugo’s best tools is his ability to hit for average. With the skill of hitting the barrel of the bat using a compact and measured swing, Verdugo is an excellent contact hitter. His hands are quick through the ball and he is a disciplined hitter with very solid mechanics. He sees the ball out of the pitcher’s hand quickly and recognizes the spin on breaking balls. He is advanced in his ability to hit pitches other than fastballs. His good eye-hand coordination is helpful at the plate. Via Dennis Schlossman at Think Blue PC; "Dodgers Prospects: A Closer Look at Tim Locastro." The Topps blog shares some proofs of their 2017 Inception Baseball card set; including the Julio Urias card on the right. Go here to check out more. 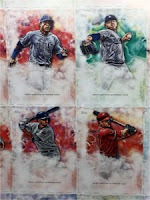 This set is slated to be released in April next year. This certainly doesn't bode well for our cable TV overlords. Per Ben Munson at Fierce Cable; "Sports network affiliate fee growth to slow, Nathanson says." Sure, why not? Per Liz Roscher at Yahoo Sports; "Manny Ramirez is eyeing another comeback, but where?"